The Philippine Postal Corporation (PHLPost) will issue limited copies of the special commemorative stamps in honor of Miss Universe 2015 Pia Alonzo Wurtzbach. PHLPost hopes to issue and launch it this month upon securing the approval and permission from the Bb. Pilipinas Charities Inc. and the Miss Universe Organization with regards to the availability of Pia, which has been hectic since winning the crown. “The Philippine Postal Corporation (PHLPost) takes pride in honoring our very own Ms. Pia Alonzo Wurtzbach by immortalizing her with a postage stamp as the third Filipina to win the prestigious and much coveted Miss Universe crown”, OIC, Postmaster General Joel Otarra said. PHLPost said that the glittered souvenir sheets will surely be a hit among collectors in the country. The souvenir sheet of the stamps will feature a special embellishment called tactile glittery texture embossed to enhance the important look and feel of the stamps. The glitters would be limited to her crown, if when touch, you would feel the rough texture on it. 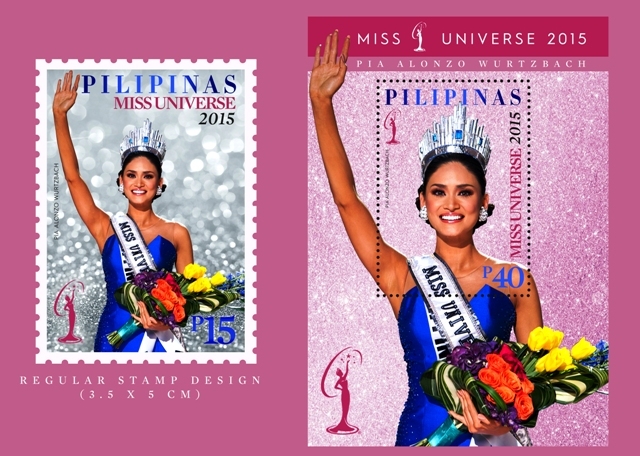 The regular stamp as well as the souvenir sheet will feature a photo of Pia in her shining moment when she was crowned Miss Universe last December 2015 in Las Vegas. PHLPost will issue 101,000 pieces of the regular stamps which will cost P15 each, while 5,000 pieces of souvenir sheets will be released, to be sold at P40 per piece. Pia now will join the PHLPost roster of “living legends” who are given the rare privilege of being featured in a postage stamp which includes boxing legend Manny Pacquiao, Miss Universe 1969 Gloria Diaz, Miss Universe 1973 Margarita Moran, and Miss World 2013 Megan Young.